Can the Buccaneers bounce back from a dreadful 2017? We take a look at their offensive stars. The former number one overall pick will be entering his fourth year as the starting quarterback in Tampa. Winston had a forgettable year in 2017 that was marred by injury and inconsistent play by the offense. The Buccaneers went 3-9 in games started by Winston, and they finished the year 18th in total scoring. Statistically, Jameis had his best year as a passer in completion percentage and passer rating. Winston completed 63.8 percent of his passes, up from 60.8 percent in 2016. His passer rating also rose to 92.2 percent, besting his previous high of 86.1. Fantasy speaking, Winston averaged 15.5 points per game which ranked him 16th among all quarterbacks with at least 13 games played. Winston will once again be the starting quarterback in 2018, and he is in the final year of his rookie contract with a team option for a fifth year. 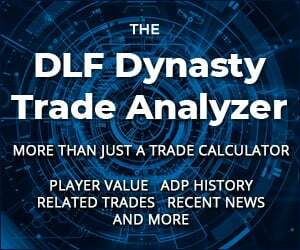 Winston currently has an ADP of 102.17, the tenth quarterback drafted according to DLF’s January ADP. It is also worth noting that Winston is under NFL investigation for allegedly groping an Uber driver in 2016. If the NFL decides that Winston broke league rules, he could miss some time in 2018. This is something to monitor for fantasy owners. Richard is a fantasy football fanatic through and through hailing from rural Ohio. Whether its dynasty or redraft, best ball or DFS, or just a free family league, you can count on him giving 100% at all times. Hey, Sabrina! I would rather have Winston, though they are close for me and probably within the same tier at this point. Thanks for reading! Thanks for the insights, Richard. My only point of disagreement with you would be on Brate’s value. He’ll be a restricted free agent this year, and I could see a scenario where he ends up with another team. Assuming he does stay with the Buccaneers, he’s one of Winston’s trusted targets, one I feel will continue to get red zone looks and eat into Howard’s totals as long as he hangs around.